Why Hundreds of Thousands of Aussies Have Switched to Kogan Mobile..
We encourage everyone to compare our prices. If you’re not with Kogan Mobile, you’re probably paying too much. Check out our amazing prices on prepaid mobile options. All with unlimited standard national calls and texts* plus heaps of data! Switching to Kogan Mobile is quick and easy in just a few steps. If you’ve got any questions, we’ve got a friendly and knowledgeable support team ready to help. We make Bill Shock a thing of the past. Kogan Mobile has no hidden costs - no flagfall fees - no payout fees, no additional charges and no unlocking costs. Kogan Mobile is fast. Really fast. Take advantage of faster speeds and excellent coverage thanks to blistering 4G3. All you’ll need is a 4G enabled handset and connection in a 4G coverage area. Want to keep your existing number & device? No problem. When signing up, you can choose to keep your existing device & number, or to get a new number - it’s that simple! On Kogan Mobile you’ll have heaps of blistering fast 4G3 data to WhatsApp, Viber, Skype, FaceTime, and send high-res photos to family and friends overseas. Or for those that like to travel, we also offer International Roaming Packs. 1. Not for commercial or resale purposes. For use in Australia. You must order a free Kogan Mobile SIM from Kogan.com before purchase of a Prepaid Plan. Once your SIM is delivered you can buy and activate your Prepaid Plan. 2. Data sessions rounded to the nearest KB. Once data inclusion is exhausted, you will need to purchase a data pack or recharge to continue using data. Unused data expires on next recharge, the beginning of the next 30 day block or expiry date of the recharge, whichever is earlier. For 30 Days Plan: data expires after 30 days or upon next recharge, whichever occurs first. For 90 Days Plans: Comes with 9GB (SMALL 90 DAYS Plan), 39GB (MEDIUM 90 DAYS Plan) 60GB (LARGE 90 DAYS Plan) or 120GB (EXTRA LARGE 90 DAYS Plan) Total Data, split into 30 day blocks as per plan table, which is replenished every 30 days. If Data Per 30 Days is exhausted before 30 days has elapsed, access to data will cease until the beginning of the next data 30 day block (if any), or the customer recharges or purchases a data pack. For 365 Days Plan: comes with up to 37,376MB (SMALL 365 DAYS plan) 161,963MB (MEDIUM 365 DAYS Plan) 249,173MB (LARGE 365 DAYS Plan) or 498,347MB (EXTRALARGE 365 DAYS Plan) Total Data, in each case split into 30 day blocks as per prepaid plan table from days 1 – 360. 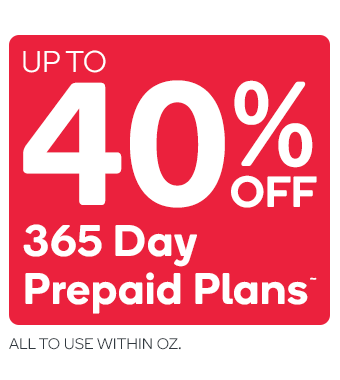 From days 361 – 365, 512MB (SMALL 365 DAYS Plan), 2219MB (MEDIUM 365 DAYSPlan) 3413MB (LARGE 365 DAYS Plan) or 6827MB (EXTRA LARGE 365 DAYS Plan) will be added to the account. 1GB = 1024MB. If Data Per 30 Days amount is exhausted before 30 days has elapsed, access to data will cease until the beginning of the next 30 day block (if any), or the customer recharges or purchases a data pack. 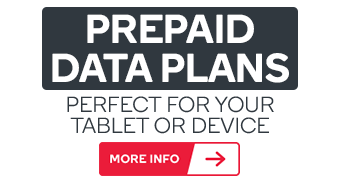 Looking for Data Only Plans?